Ford has reached a milestone for its Mustang nameplate, with the 10,000,000th car coming off its production line at Flat Rock, Michigan. The 10,000,000th Mustang is a white convertible, with a 450 PS V8 under the hood. The specification is a tribute to the first serialized 1965 Mustang (retrospectively labelled a 1964½ model) that came off the production line in early 1964—that model was also a white convertible, but with a mere 164 hp and a three-speed manual transmission. Mustang is arguably Ford’s best known nameplate, with recognition exceeding that of its more humble saloons. Its Facebook page has more likes than any other nameplate’s. Ford claims that the Mustang is the US’s best selling sports’ car of the last 50 years, and the world’s best selling sports’ car of the last three. The original “pony car” sold in the hundreds of thousands in its first year, with Ford correctly identifying a youth market. The Mustang could be specified with a wide variety of options, suiting everyone from younger buyers, women who wanted a more stylish car than what was on offer from the US Big Four, drivers wanting a car with a sporty image, to families who needed a second car. Based then on the compact Falcon, Ford brought the original Mustang to market with proven mechanicals. Today’s Mustang retains the rear-wheel-drive layout but is a far more high-tech affair, with a 12-inch digital instrumentation cluster, a choice of a six-speed manual or a 10-speed automatic transmission, adjustable suspension, and pedestrian detection. 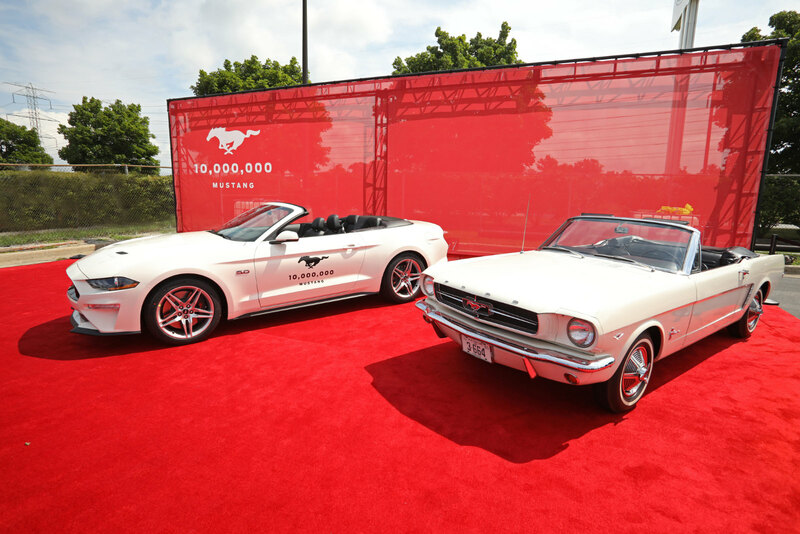 Ford celebrates the 10,000,000 milestone with flyovers from three World War II-era P-51 Mustang fighter planes, after which the car was named, and a parade of Mustang cars driving from Dearborn to Flat Rock. It also marked the 50th anniversary of Bullitt with a special-edition model (below) harking back to the 1968 fastback used in the film. The Mustang has been built in six distinct generations to date.